Coloring Anatomy: Eyes are very important to a successful Character image — Vanilla Arts Co. I usually run across them in Google searches as I look to see how other people have colored the stamp image I'm about to teach. There are always a few versions that make me wonder what in the heck the colorer was thinking. Some coloring projects turn out better than others. And here's the weird part, even though most Copic colorers are completely obsessed with blending, poor blending usually is NOT the culprit when a good stamp image fails. Sometimes projects head south due to color selection, sometimes it's heavy handedness, sometimes it's simply a competent yet mind-numbingly dull coloring job. It's in our nature, in our DNA. I'm betting it goes back to before our caveman days. We make snap judgments about people based on their eyes. It takes only a second for the alarm bells and whistles to go off. "That person is not friendly!" We use this same instinct when looking at stamp images. You can color the happiest, cutest bunny birthday card in the history of all of greeting card history, but if the rabbit's eyes read wrong, you're going to freak the heck out of the birthday girl. I'll admit, there's one stamp company that produces really great coloring images, perfect for Copic coloring. And yet, I absolutely will not use them in beginner level classes anymore. It's because of the eyes. They're usually little black scribbled dots with a few lines scratched across them to indicate eyelids. My beginners have a very high failure rate whenever an artist is unclear about eye size, eyelid or eyebrow placement. In short, when the stamp leaves the colorer guessing about the eye anatomy, any student who can't draw is doomed. But sometimes the artist gives you lots of information and the eyes still turn out weird. Pupils are the little black dots in the center of your eye. You have the whites of the eye, they're easy to color. Inside the white is usually a colored disk called the Iris. I say "usually" because a great many stamp artists simplify their stamps by eliminating the iris. Inside the iris is the black dot, the pupil. It's the opening inside the eye. Get that pupil wrong and your critter suddenly looks like he has a raging case of rabies. So what makes a good pupil? Let's take a look! This is "Ducky Fun" from C. C. Designs, the coloring project for my beginner level students this month. I'd say my students had a 100% success rate coloring very friendly ducks but the dragon? We had some very interesting dragon personalities. Both classes had some really cute dragons and both classes had a few that looked like they were about to devour their little duck friends. Because I gave this image to my students stamped in light gray, everyone had to use a black Copic Multiliner to darken the existing pupils. Some students faithfully traced the original pupils (as shown in my sample here). But some students (either by choice or accidentally) changed the size, shape, or position of the pupils. That's when the strangeness started. I Photoshopped the eyes to give us a blank canvas. Let's experiment with pupils and see what happens to our cute duck-lovin' dragon when good eyes go bad. The size of the dot makes a difference. The bigger the pupil, the more you want to hug the character. Large iris and/or pupils also add youth to an image. I'm doing more here than changing which direction the dragon is looking, I'm changing the story. A more direct gaze between the dragon and his ducks makes the dragon look more intelligent. It also indicates that there is communication going on between the characters. Point those same pupils skyward and now we're wondering what the dragon is thinking about. Be intentional about where you place the eye highlights. Dead center placement has hypnotized this first dragon. The wimpy lights of the second feel wrong too. Keep the dots ON the eye. When a pupil leaves the eyeball, even ever-so-slightly, it doesn't read correctly. Unless your character has been hit upside the head recently with a 2x4, keep to a consistent size and location. That's not to say you can't bend the rules a bit. 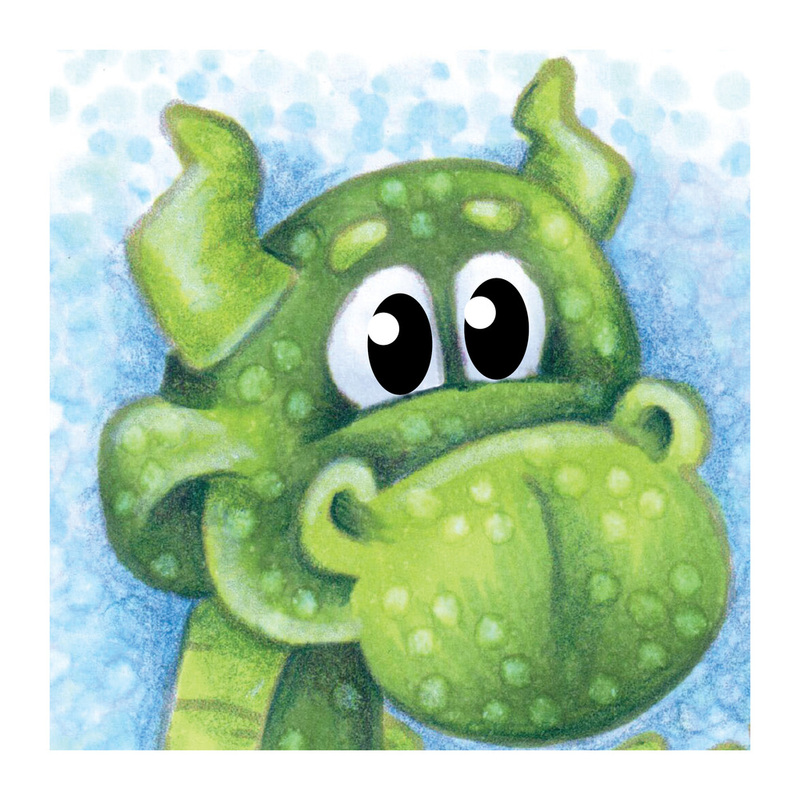 Here the difference in pupil size adds whimsy to the dragon. But be warned, it also subtracts a few I.Q. points. Changing the shape of the pupil gives this first dragon a more reptilian look. It also makes him less trustworthy. The second set applies a bit of animator's wizardry. If you can't add a scowl by changing the eyebrows and/or eyelids, you can fool us by making the pupils frown. This guy is definitely planning Duck a l'Orange tonight. That killed off the warm and fuzzy feelings fast, didn't it? Character studies aren't just for Disney animators. Practice helps the pros but it can also improve the quality of your coloring. It's all too easy to throw off the expression that the stamp artist intended. One little oops on your part or maybe an unclear stamp image and suddenly you're dealing with a complete change in character. Really good colorers know how to troubleshoot these problems. They know how to deal with ink blobs and accidents and how to keep them from overwhelming the character's intention. I recommend that all colorers regularly pull out a sheet of scratch paper and play with simple smiley faces. By experimenting, you learn. Deciding that "up and to the left" makes a face look more thoughtful while "down and to the right" makes a face look sly, you can better deal with the stamps you encounter in your projects. Familiarity with how a character's eyes communicate with your viewer will help you solve common coloring mistakes, deal with badly drawn stamps, or to deliberately change the story your image tells. Plus, it's fun to doodle. You can do it, it's just ovals and dots! Play with some simple expressions and see what you can do.